The Department of Defense released a report in February 2012 raising significant concerns to Congress about integrating women into combat units, an issue receiving renewed attention given outgoing Secretary of Defense Leon Panetta's recent announcement that women would be allowed in combat roles. The report raised five "serious practical barriers, which if not approached in a deliberate manner, could adversely impact the health of our service members and degrade mission accomplishment." The largest difficulty yet to be overcome are the "physically demanding tasks" that the Department of Defense used to exclude "the vast majority of women" in combat roles. "The elimination of gender-restricted assignment policies requires deliberate action," the report says. Its proposed solution is the creation of "gender neutral-physical standards." "If we go forward with this, you are going to see serious physical injury increase," said Mackubin Thomas Owens, a professor of national security affairs at the U.S. Naval War College. "People in Afghanistan are carrying huge loads. We’re sending our troops places where they can only walk." 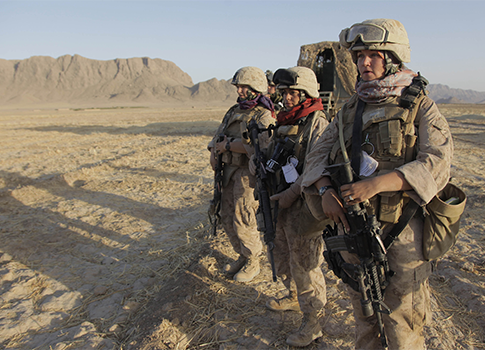 A separate Congressional Research Service (CRS) report in December 2012 outlining the debate and history of women in combat roles elaborated on the term gender-neutral. The use of the term "gender-neutral physical standards" raises questions depending on how it is defined. A plain reading of the term suggests that men and women would be required to meet the same physical standards in order to be similarly assigned. However, in the past, the Services have used this and similar terms to suggest that men and women must exert the same amount of energy in a particular task, regardless of the work that is actually accomplished by either. Hypothetically speaking, if a female soldier carries 70 pounds of equipment five miles and exerts the same effort as a male carrying 100 pounds of equipment the same distance, the differing standards could be viewed as ‘gender-neutral’ because both exerted the same amount of effort, with differing loads. A source from the Department of Defense confirmed to the Washington Free Beacon that the definition in the CRS report is accurate, and that the "the services are currently working on gender-neutral standards for certain things." "Notably absent in this language is any mention of the effects on military readiness such changes may produce," according to the CRS report. Defense Secretary Leon Panetta assured the public during Thursday’s press conference that he was "not talking about reducing the qualifications for the job—if they can meet the qualifications for the job, then they should have the right to serve, regardless of creed or color or gender or sexual orientation." The Department of Defense will "continue to assess, develop and validate gender neutral standards so that we can start assigning personnel to previously closed occupations," Gen. Martin Dempsey said during Thursday’s press conference. Changes to military policy cannot be implemented until the Senate Armed Services Committee (SASC) reviews the changes. "At the end of the day, none of this will be understood until 2016," said an aide for Sen. James Inhofe (R. Okla.), a member of the SASC. "The Pentagon advises the committee of its changes, and gives the committee time to pass legislation. The committee has not been informed of any specific changes yet." Inhofe raised concerns in a press release. "If necessary, we [the SASC] will be able to introduce legislation to stop any changes we believe to be detrimental to our fighting forces and their capabilities," Inhofe said. "I suspect there will be cases where legislation becomes necessary." A Department of Defense source chose not to comment when asked about concerns SASC members may have about gender-neutral standards described in the February report. "If you make the argument that it will make the Army better, that’s one thing," Owens said. "But no one is talking about that. This entry was posted in National Security, Politics and tagged Armed Services Committee, Congress, Department of Defense, Leon Panetta, Martin Dempsey, Media, Middle East, Military, Obama Administration. Bookmark the permalink.